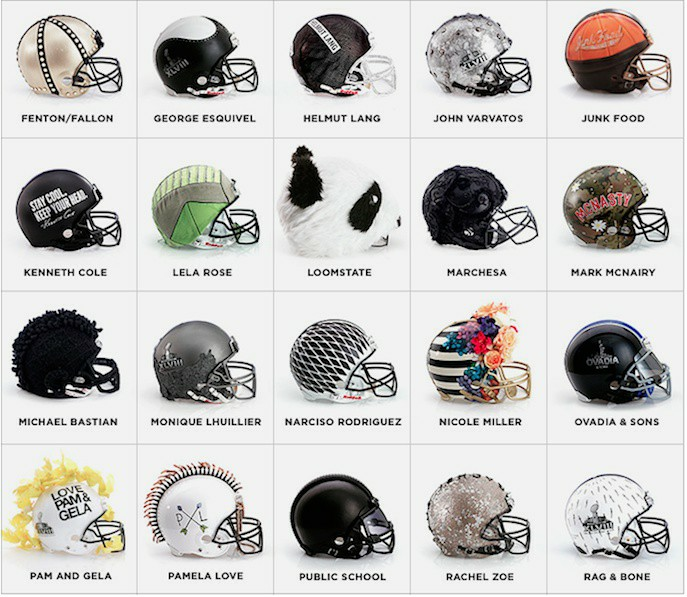 In celebration of Super Bowl XLVIII and in support of the National Football League Foundation, the CFDA and Bloomingdale’s have teamed up on a special collaboration of 48 bespoke football helmets, created by an all-star team of designers. The helmets are being auctioned online, with 100% of the net proceeds benefiting the NFL Foundation, dedicated to promoting and improving the safety of the game. The NFL has been under much scrutiny as of late with numerous retired players coming forward revealing chronic traumatic encephalopathy (CTE), a brain disease linked to repetitive head injuries. CTE causes neurobehavioral problems like memory loss, depression, suicidal thoughts and dementia. The NFL Foundation recently gave a $1.5 million grant to launch Heads Up Football, in an effort to promote better and safer game. This fabulous collection of haute helmets are currently on display in the windows of Bloomingdales 59th street flagship store in Manhattan. Participating designers include Alejandro Ingelmo, Betsey Johnson, Billy Reid, Cynthia Rowley, Catherine Malandrino, Cynthia Rowley, Diane von Furstenberg, Donna Karan and Narciso Rodriguez, just to name a few. Fashion and football fans can visit Bloomingdales.com/superbowlhelmets to access the NFL Auction and bid on these one-of-a-kind Super Bowl XLVIII helmets. The auction ends February 4, so don’t miss this opportunity to own one of these couture sport headpieces and support the cause!